Over the weekend, I complained about the hills at Saturday’s race, The Beamsville Bench. The course (a 5K course over a 2.5K loop) started on an uphill for about 700m, plateaued and then dropped, climbed again from 2k to 3K, flattened again, and climbed from 4K to the finish. The hills were easier than the ones that I train on but, combined with the heat on the day of the race, I had nothing left to give for the last kilometre; my quads died. Dressed to tempo on one of the hottest days of the year. When I described what I went through to my coach, his response was simple: more hill work. Umm, no thank you; I have quite enough as it is. But when this week’s training schedule arrived in our inboxes, today’s workout revealed the dreaded hill repeats. On top of that, the GTA is in a middle of a heatwave and with high humidity, so our hill workout was guaranteed to be tough. Oh joy! Heat, humidity and hills. What more could a girl want? Normally, I don’t mind hill repeats. They are hard, but each repeat is usually just a minute long so it ends quickly, especially when you compare it to a tempo run which lasts for twenty minutes or longer. The only real problem with hill repeats is they come in droves and the reprieve between each never seems long enough. Without a doubt, training on hills does make me a stronger runner. If I am going to race on them, I need to train on them too. The bottom of the hill, which we had the good luck of running up twice. 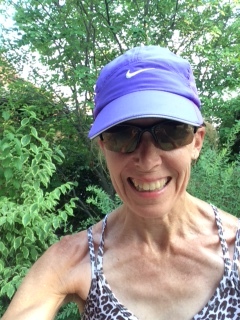 By 6:00, luckily or not, the “feels like” temperature was hovering around 35 degrees celsius so our workout was “simplified”: a 6K tempo with 3 hills. The men took off ahead of my training partner, Kelly-Lynne, and me. The two of us stuck together, not knowing at the time that each of us was simply trying to hang onto the other. We pulled each other around the looped trails and up and down each of the three dreaded hills. Teamwork. After our tempo, all of us headed to the splash pad across the street from the entrance to the trails. Socks and shoes came off and we walked through, letting the water cool our feet which, in turn, helped lower our body temperature. The rest was easy: a short cool-down run back to the Rec. Centre. Once I got home, I raved about my tonight’s run, brought to me by heat, humidity and hills. Am I crazy? Probably, but I know my limits and had the safety of running with my training partners. And the next time I have to race hills in the heat, I’ll be just a little bit stronger. I heard the course was going to be challenging. Hills, road, gravel, out and back: those were the descriptors that my running mates who had raced it before used. They also sighed and, now I know why, they have only raced it once. Weeks ago, one of my running partners, the lovely Miss Monica, asked me to race the Bench 5K with her. With the PanAm Games in the GTA, a lot of the regular summer races have been cancelled. The Bench, held at the Mike Weir Winery in Beamsville, Ontario, was one of the few left to pick from throughout July and August. While I would have preferred a longer distance to help me in my prep for Chicago, I decided that testing myself with the 5K would be a good idea. Besides, how tough could it really be? I’ve raced tough and hilly courses – well, hilly as far as southern Ontario is concerned – and I can certainly run a 5K. After a winter off running and exercise, I am finally feeling healthy, rested and fit. At 8:30 this morning, I left the house feeling confident. By 10:00, as we started to warm up, I realized that I was going to be in for a tough day. First, it wasn’t an out and back course; it was two loops. Miss Monica and I jogged it, which started on an uphill for the first 700m, flattened out, dropped gradually and climbed again for the last kilometre. Lucky for us, being a 5K course, we were going to be able to race that loop twice and go around it again for a cool-down. I started the race well, going through the first kilometre in 4:18 and the second, I believe, in 8:28. Somewhere between those kilometres, I pulled ahead of two other women; every time, I heard them breathing closer to me, I tried to surge a bit ahead. After climbing the hill at the end of the first loop, I felt that I had opened a gap, but I wasn’t really sure how big that gap was. My race fell apart, though, at the end of the second loop. Even though I tried to use the flat and the slight downhill to relax my legs, it wasn’t enough; the last kilometre was a beast. I struggled to get over the final hill and, even though I have raced and trained on much tougher hills, this was one of the toughest finishes I have had. Cooling down with a lap around the course and a few extra kilometres gave me time to reflect on why the course seemed so difficult. I found out later that all times were slow; ladies who finished ahead of me were 1.5 to 2 minutes slower than usual; my time was about a minute slower so I felt positive about that. By late afternoon, after I got home feeling exhausted, needed a nap and lots and lots of liquid, I realized that it was the heat, not the hills, that did me in. 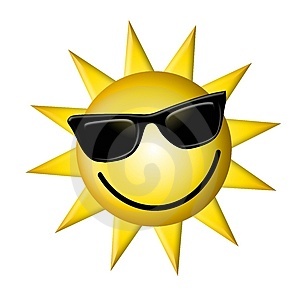 We had started at 10:30 when the sun was already up, humidity was high and there was no shade. Summer racing is tough. I wanted a challenging course and I got it. But I walked away with a few other perks. 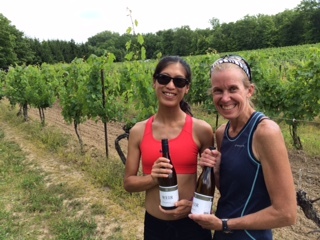 Monica finished third overall and I finished 7th (in 22:37), but being 51, I was earned the top master prize: a running hat and a bottle of Mike Weir’s wine. To that, she took it and said, “Thank you. I don’t want it but it’s his (pointing to whom I assume is her boyfriend) first race and I wanted him to get a medal for it.” While walking away to catch up with Monica, I turned around and saw him smiling, proudly wearing a “gold” medal around his neck. He earned that medal. In the same way that we often praise the faster runners for their times, we have to remember that the new runners, the slower runners and the back of the packers are working just as hard. It’s all relative. 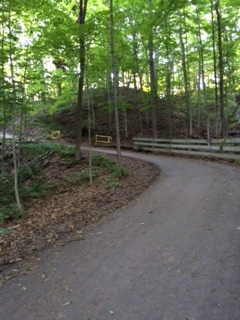 For experienced runners or those new to the racing scene, the Beamsville Bench 5K is a tough course. Anyone who finished it is a winner.